Optic disc drusen (ODD) are recognized to cause visual field defects. Enlarging drusen within the tight space of the lamina cribosa can impart compressive force on the retinal nerve fibers exiting the eye here. 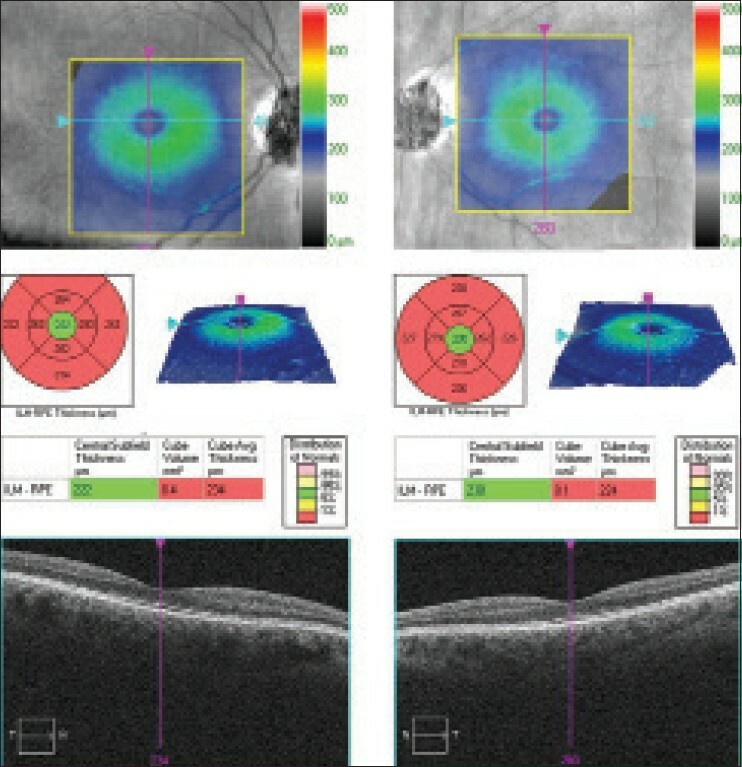 We present a case of bilateral advanced ODD causing visual field constriction in which optical coherence tomography (OCT) demonstrated both peripapillary and macular retinal nerve fiber layer (RNFL) thinning. A 42-year-old Caucasian female with bilateral ODD was referred by her optician with worsening visual field loss particularly affecting her right eye. She had previously been functioning normally, however the recent visual field deterioration meant she was no longer confident driving. There was no notable medical history. Best corrected distance visual acuity (Snellen) was 6/6 -3 OD and 6/5 + 2 OS, near acuity was N5 bilaterally. A mild right relative afferent pupillary defect was noted. Examination of both anterior segments was unremarkable and Goldmann applanation tonometry revealed pressures of 12 mmHg in each eye. Fundal examination revealed healthy appearing maculae and retinae; however, each optic disc had a large number of visible confluent drusen occupying the entirety of the nerve head [Figure 1]. Goldmann visual field tests demonstrated gross constriction particularly affecting the right eye [Figure 2]. 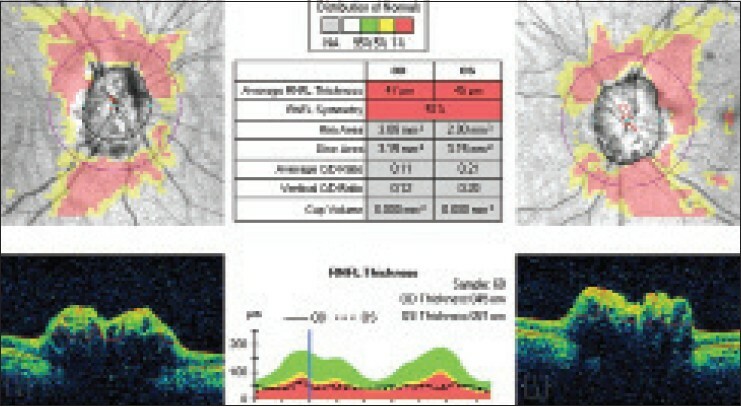 Optical coherence tomography (OCT, Cirrus HD-OCT Model 400, Carl Zeiss Meditec, US) of the optic discs and maculae were performed; these demonstrated both peripapillary and macular RNFL thinning bilaterally [Figure 3] and [Figure 4]. 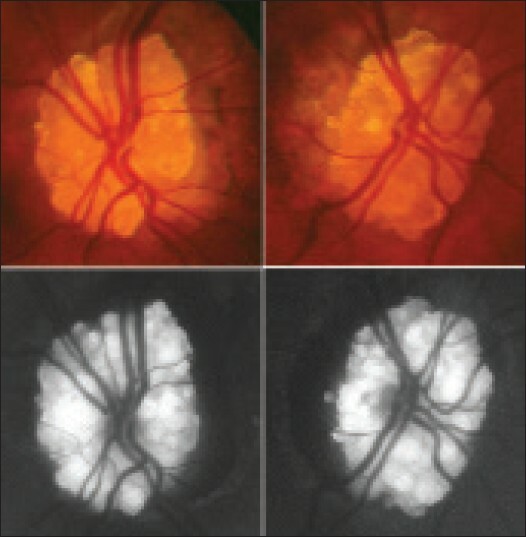 ODD have been linked to cases of hemorrhagic and serous retinopathy, which can involve the macula;  however, the authors could not find any publication describing the pathological effects of ODD on the macular RNFL. In our case, the OCT demonstrated bilateral thinning of the macular nerve fiber layer in each eye; in particular, gross attenuation of the maculopapular bundle is noted. We note that the fovea, which is free of a retinal nerve fiber layer, was of normal thickness on the macular OCT for each eye. This case demonstrates the use of OCT for observing the effects of advanced ODD on the RNFL both around the optic disc and at the macula. This case also reminds us of the severity of some cases of ODD and the potential for the condition to cause serious sight impairment. 1. Tso MO. Pathology and pathogenesis of drusen of the optic nerve head. Ophthalmology 1981;88:1066-80. 2. Friedman AH, Gartner S, Modi SS. Drusen of the optic disc. A retrospective study in cadaver eyes. Br J Ophthalmol 1975;59:413-21. 3. Mustonen E, Nieminen H. Optic disc drusen-a photographic study. II. Retinal nerve fibre layer photography. Acta Ophthalmol (Copenh) 1982;60:859-72. 4. Tatlipinar S, Kadayifçilar S, Bozkurt B, Gedik S, Karaagaoglu E, Orhan M, et al. Polarimetric nerve fiber analysis in patients with visible optic nerve head drusen. J Neuroophthalmol 2001;21:245-9. 5. Roh S1, Noecker RJ, Schuman JS, Hedges TR 3 rd , Weiter JJ, Mattox C. Effect of optic nerve head drusen on nerve fiber layer thickness. Ophthalmology 1998;105:878-85. 6. Wilkins JM1, Pomeranz HD. Visual manifestations of visible and buried optic disc drusen. J Neuroophthalmol 2004;24:125-9. 7. Katz BJ, Pomeranz HD. Visual field defects and retinal nerve fiber layer defects in eyes with buried optic nerve drusen. Am J Ophthalmol 2006;141:248-53. 8. Rubinstein K, Ali M. Retinal complications of optic disc drusen. Br J Ophthalmol 1982;66:83-95.